During the American Revolution, Reading was used as a prisoner of war (POW) camp for British and German mercenary soldiers, to include Hessians. At this time, Reading was dominated by German-speaking colonists. 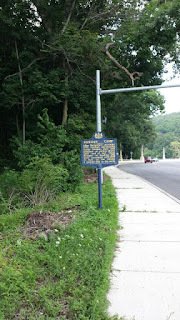 British and German prisoners who lived in Reading at this time were able to work as laborers and go to local taverns in town. The German-speaking colonists of Reading were far more welcoming of German mercenary POWs than British POWs. 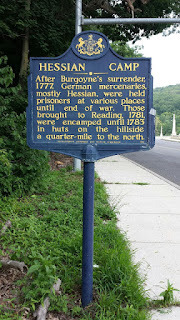 Following the American Revolution, numerous German mercenaries chose to remain in the area to work as laborers and farmers. 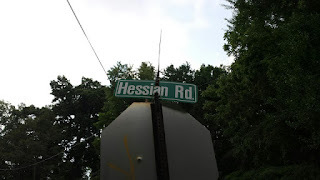 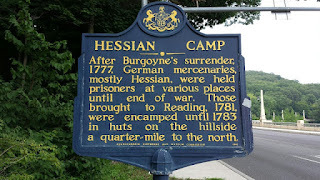 The Hessian Camp marker in Reading marks the approximate location of where numerous Hessian soldiers lived from 1781 to 1783.